Remember when we informed you that GM planned on increasing its towing and payload of its new HD trucks before year’s end? Well, that has turned out to be true. After a 25,000 mile, 100 hour road trip of maximum payload and trailer hauling across the mountains of the western United States, GM’s Heavy Duty truck engineers realized they created a monster. A very powerful, capable and best-in-class-everything monster. “The first set of capability tests confirmed that the team had exceeded the payload and towing targets by a significant margin. Ongoing testing demonstrated a clear opportunity to increase the true capabilities of these trucks. Even pulling a combined weight of nearly 15 tons seems easy behind the wheel of a 2011 Silverado HD 3500 with the Duramax Diesel.”, said Rick Spina, a GM Full-size Truck global vehicle line executive. The results of the testing are staggering: 21,700 lbs. towing from the fifth wheel, 17,000 lbs. hitch towing, 6,635 lbs. of payload, and the GCWR towers to 29,200 lbs. All that while being accompanied by a colossal 6.6L Duramax Diesel V8 engine pumping out 397 horsepower and 765 lb.-ft. of planet-moving twist. When GM first announced its new Heavy Duty trucks, the HD numbers rated at 6,520 lbs. maximum payload and 20,000 lbs. maximum fifth wheel towing (16,000 lbs. from the hitch). These numbers gave the new Ford F-350 an edge, with a 21,600 lb. fifth wheel towing capacity (16,000 conventional) and a 6,520 lb. payload. Not anymore! Now before you begin writing in the comments area, remember that this isn’t just a numbers gimmick GM is pulling. This is real engineering. The new ratings come from a few slight mechanical tweaks as well as miles upon miles (and hours upon hours) of punishment to assure the engineers of the trucks’ ability to take the punishment. The mechanical part comes from some clever engineering, as the pickup truck’s box structure got some reinforcements from some higher-gauge steel in both the #2 and #4 cross sills. The outcome pushes the payload an additional 300 pounds. The towing increase comes from extreme testing that ended up surprising GM’s engineers, specifically with how the trucks handled the aforementioned weight. As such, they upped the ante by 1,000 lbs from the hitch and 1,700 from the fifth wheel. Even so, the HD trucks took the punishment with enthusiasm. Given this, it’s safe to say the all new Chevy Silverado/GMC Sierra (as well as the Sierra Denali) Heavy Duty models will wear the heavyweight belt for the time being. The towing capacity looks good…but……isn’t that just a paper game GM and Ford are playing? What is the REAL payload???? Why didn’t they have these payload numbers from the start? 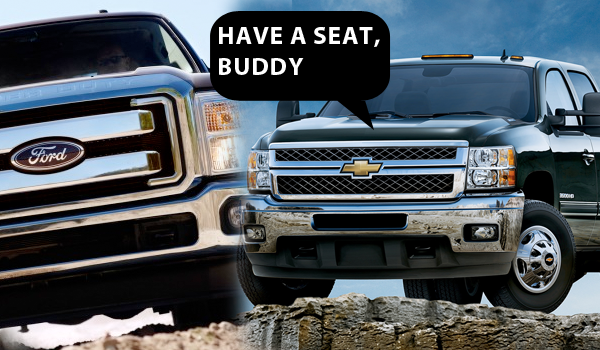 Funny the GM guys upped theirs after Ford went to press…..What’s your thoughts? Greg, it depends on what your point of view is. In terms of the payload increase, the new HD’s box structure got some reinforcements from higher-gauge steel (#2 and #4 cross sills) – so this is real engineering in action. As far as the towing increase goes, manufacturers have been understating capacities, power figures, and such for the last decade. It seems to be a trend to be conservative nowadays – which comes in useful – especially in situations such as this one. The Duramax is the most powerful engine in the class and the new Heavy Dutys have an all-new frame (fully boxed). As such, I’m sure GM was a bit surprised when Ford came out with their SuperDuty numbers that were higher than the new GM trucks. So GM went back to test the new HD truck (25,000 miles and 100 hours road trip of maximum payload and trailer hauling across the mountains of the western United States). At this point, the engineers at GM were more sure of the truck – so they increased the specs. In the end, isn’t it all numbers game? I mean – there isn’t an exact formula for estimating towing or payload – so all these numbers are (educated) estimates. But at least on the part of GM, they’re sure of them. Yes, Greg it is a numbers game indeed and there is some strategy to it. The payload numbers from the start were early test results, where the newer ones are from final testing after a few tweaks were made. GM is finally starting to hand over their new HD product to the media, and compo tests are going to be out very soon. We will see who’s really who then.